Here are 9 tips for service providers, vendors, and sponsors participating in industry conferences and trade shows. The practice of law is a noble profession steeped in tradition. But that doesn't matter to businesspeople chasing earnings targets. We seek Business Velocity. 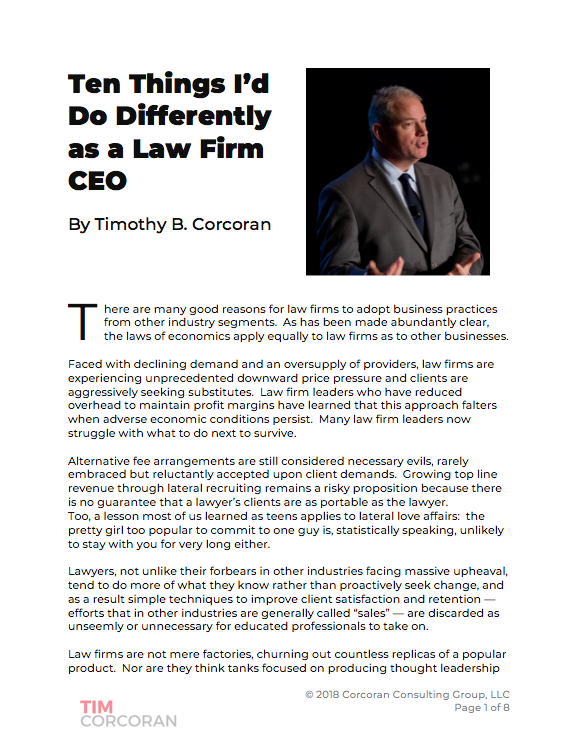 This critical disconnect is why many lawyers miss opportunities to thrive in today’s competitive legal market. Military spouses who are qualified lawyers face challenges finding sustainable employment. TCDI offers a solution to this societal problem that also provides benefits to its law firm and law department clients. It’s critical for law firm marketers to know the power of Legal Lean Sigma®️ and Project Management to help differentiate their firms in the marketplace, but it’s also critical to know how to apply these same concepts to better manage routine marketing and business development functions. Law firm leaders are waking to the realization that partner compensation plans often underemphasize business development and, in some cases, pose a significant obstacle to fostering a collaborative, client-focused, continuous improvement and growth-oriented culture. It’s time to fix that.